Detail from the poster of the event. The Hellenic Maritime Museum participates again this year in celebrating the European Days of Cultural Heritage by presenting the “Urban Game Sketchbook” event and “Piraeus: Port of Triremes” in collaboration with the “Zea Harbour Project” and the “Urban Game Team”. 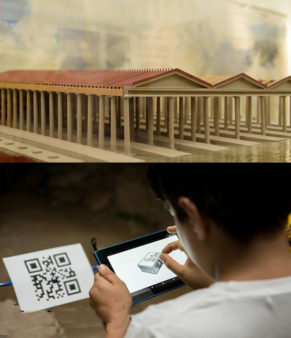 Through a digital interactive game application, video screening and exhibits from the collection of the Hellenic Maritime Museum as a starting point , the public is shown the ancient monuments of the Zea dockyard that are “hidden” within the urban web of today’s city. With the aid of digital technology, an entertaining experience is offered in the style of an adventure game that aims to contribute to the visitor’s understanding both of the ancient port’s function and of the timeless evolution of the historical landscape. The activity will take place on Friday September 28 and Saturday September 29 from 9.00- 14.00.